There are numerous manufacturers and vendors for ceiling hoist lifts. When it’s practical for your patient census, it is less expensive to install ceiling tracking in more than one area and use portable hoist motors that can be moved room-to-room as needed for patient transfers and movement. The Employer-at-Injury Program (EAIP) is designed to encourage the early return to work of injured workers. EAIP is administered by all workers compensation insurers in Oregon. Insurers establish their own EAIP policies & practices. SAIF will pay vendors directly for EAIP equipment purchases. Other insurers require employers to cover the cost of equipment until they are reimbursed by the State of Oregon. 1) Injured workers must have filed a workers compensation claim and be released for work with restrictions that prevent the worker from doing full-duty regular work. 2) ​The injured worker must be doing “transitional work” which must be within the worker’s specific injury-caused restrictions. 1) Information and advice based on my experiences using EAIP work site modifications to purchase ergonomic equipment for Peacehealth Sacred Heart Medical Center injured staff. 2) List of 14 types of equipment that have been purchased by Peacehealth using EAIP funding. 3) Sample Equipment Justification Form with specific injured worker case example. 4) Full texts of justifications for 7 types of patient handling equipment that you are welcome to adapt and use. The Medicare Access to Radiology Care Act of 2017 was introduced on March 29 by Senator John Boozman (R-AR) as S. 769 and on April 5 by Rep. Pete Olson (R-TX) as H.R. 1904. These bills will enact a law that amends Medicare reimbursement policy and supervision levels for radiologist assistants to align them with state radiologist assistant laws. Adoption of new language contained in H.R. 1904 or S. 769 will enable radiologist assistants to work under less stringent supervision levels and be more efficient health care providers. Passage of the bill will allow radiologists to devote more focused time reviewing and interpreting complex medical images or urgent cases, thus increasing access to care. Radiologist assistants have advanced education and clinical experience, and can expertly and safely perform radiologic assessments and certain procedures that traditionally are performed only by radiologists. Without Medicare's recognition of radiologist assistants, the profession is in peril. As a direct result of Medicare's current policy, radiologist assistants are losing their jobs and universities are on the verge of suspending or terminating their educational programs. All radiologic technologists can help by contacting their senators and asking them to cosponsor S. 769 and their congressman asking him or her to cosponsor H.R. 1904. This is easy to do by using ASRT's Advocacy Action Center to learn more about the bills and send a message. You can find more information, monitor activities and follow up with your federal lawmakers on the MARCA bills in the ASRT Advocacy Action Center. After a flurry of activity around SB 801, it’s now been tabled with no action since being pulled from the public hearing agenda last Monday, February 26. Although the bill has been quiet, members of the OSRT have been diligent in efforts to stay on top of the return of this bill. We’ve been requesting meetings with Senators on the Committee for Health Care, communicating with other organizations, informing technologists and the public about this bill, as well as preparing a response on further action of it. This Thursday, March 9th there will be a working session of the Senate Committee on Health Care. At this meeting they are set to discuss and hopefully adopt a non-controversial bill that OBMI submitted for consideration, HB 2267. There is a chance that at this hearing the door will be open for the details of SB 801 to be considered as an amendment. We have no formal proof that this will happen and are told it is unlikely. However, as tenacious as the ARNPs have been about being granted these privileges during this legislative session, it seems this may be a good opportunity for their cause. Rest assured, we are working to have OSRT members present at that hearing to respectfully monitor, listen and offer insight if HB 2267 starts moving toward amendment mode. Stopping SB 801 before it gets started is the best thing we can do. Your support is vital to this fight. Please continue to stay informed via our website or Facebook page. And important information that requires action will be sent via email to our members. We are always accepting new members. The affiliate that raises the most money per capita will receive $750, and the second place affiliate will receive $250. Help OSRT maximize your membership and keep dues and conference registrations at the same low price. In order for OSRT to receive credit for your entry, you must list "state affiliate" as how you heard about the drawing. Tickets are available here and by phone at 800-444-2778. Proceeds from the Annual Drawing ticket sales will go toward ASRT Foundation opportunities that support and empower R.Ts like you! At this time SB 801 is not rescheduled on the Senate Committee’s agenda; however HB 2267 is a “work session” bill. This is the bill that provides an exemption for individuals performing ophthalmic sonography. Since the RT statute will be open for amendment with this bill, the ARNPs may try to get the text of SB 801 rolled into HB 2267. There is a currently a hearing scheduled for HB 2267 on Thursday, March 9th at 1:00 PM. OSRT is working diligently with other societies and medical professionals to bring awareness to this extremely important piece of legislation. For those of you who may not be aware, OSRT was notified last week (2/23) that there is a proposed bill going to the senate that would allow Advanced Nurse Practitioners to perform imaging studies to include fluoroscopy, general x-ray, CT, MRI, etc. Advanced Nurse Practitioners include nurse practitioners, certified registered nurse anesthetists and clinical nurse specialists. (b) Performing a medical imaging modality that is within the scope of practice of the licensed nurse practitioner, certified registered nurse anesthetist or clinical nurse specialist. As you can see from the wording above, this would give Advance Nurse Practitioners authorization to not only direct techs (a), but perform imaging studies themselves (b). Given they don't have the level of education to perform these studies it puts the public at risk. We need to get everyone involved including the Radiologists in order to prevent this bill from proceeding. Attend the public hearing on 2/28/17 @ 1 p.m. at the Capital Building in Senate Room B. At the beginning of the committee meeting, there will be a table inside the door with a testifier sign-up sheet. Please fill in requested information. As the public hearing progresses, the committee assistant will provide the list to the chair, so the people who sign up will be called upon to testify. If you are not able to make the meeting, call a committee member and express that you are opposed to the bill given that APRN's have no formal training in radiography and pose a serious health risk to the public. Their contact info can be found here. Each committee has an email address to submit a written testimony. This testimony should be submitted 24 hours in advance to the public hearing. Please make sure to clearly identify Senate bill 801 at the top of you testimony. Send your written testimony to the Senate Committee on Health Care: shc.exhibits@oregonlegislature.gov. OSRT is working diligently to represent our needs, but we need your help! The sponsor, Laurie Monnes Anderson and Rep. Carla Piluso, will be holding a constituents meeting. OSRT strongly encourages your attendance at the public hearing and/or the constituents meeting. 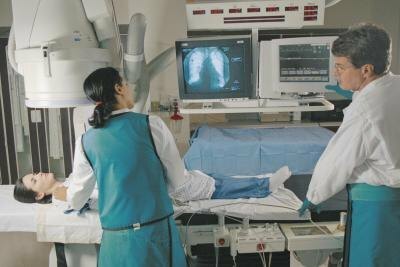 Radiation Protection Services (RPS) recently cancelled a proposed rulemaking to allow Advanced Practice Registered Nurse’s (APRN’s) to personally supervise fluoroscopy during interventional pain management procedures and requiring additional training for non-radiologist practitioners to become eligible to personally supervise or operate fluoroscopy devices. The notice of proposed rulemaking was unfiled with the Secretary of State’s Administrative Rules Unit and the related public hearing cancelled. This was due to RPS learning of a possible conflict between the draft rules and the Oregon Board of Medical Imaging (OBMI) statute that only permits physicians to supervise medical imaging equipment operators [ORS 688.405 (18)]. RPS has subsequently modified the proposed rule language so that it does not refer to “supervision” of operators by APRNs and instead would allow APRNs to give verbal instructions to operators to activate and terminate fluoroscopy if the APRN has completed the didactic, applications and clinical training that was in the original draft. Furthermore, the original proposed rules establishing additional training requirements for non-radiologist practitioners to become eligible to supervise or operate fluoroscopy devices have been removed. Our agency is requesting your feedback by December 7, 2016, in order to file a notice of proposed rulemaking with the Secretary of State. A Public Hearing will be scheduled for January 17, 2017. It is our intent to make the rules effective February 1, 2017. OSRT has recently received an update from the Radiation Protection services on the status of the request by Advanced Practice Nurses to modify OAR's surrounding fluoroscopy. The nurses have requested to move forward with their original request at this time. They would like the OARs to read that APRNs are allowed to supervise fluoroscopy in outpatient pain managements settings. The rules would include additional training requirements, a final interpretation of the images be done by a licensed Radiologist and the APRN must also become credentialed by their employer. In essence, the nurse must go through a didactic course, equipment applications, and perform a minimum of 20 procedures with supervision. Then, in order to train other nurses to supervise fluoroscopy, they must work in this role for a full 12 months. This proposed rule will go to the Secretary of State the week encompassing November 21-27. Public comments will be accepted by RPS until December 23rd. There will be a public hearing surrounding this topic on December 19th in Portland. If the rule passed it will be implemented February 1, 2017. Click here to read the official Notice of Proposed Rulemaking. Radiologic technologists can become certified in their profession, although it is not required in all states. The American Registry of Radiologic Technologists (ARRT) offers certification to qualified candidates. Many states use the scores from the ARRT examination to help make licensing decisions. As of May 2014, 11 states do not require licensing or ARRT certification for workers in this field. Alabama does not have state-licensing or ARRT exam requirements for professionals in the radiology field. Alaska does not have a state licensing requirement but does require formal training in radiologic services. Larger facilities with accreditation from the Joint Commission on Accreditation of Healthcare Organizations (JCAHO) often do not hire applicants without ARRT certification. The state of Georgia does not require licensing or the ARRT exam for radiologic technicians or operators of X-ray equipment. Idaho does not require radiologic technicians to obtain licensure or pass the ARRT exam. Michigan does not have licensing requirements for radiographers or those who work with X-ray equipment; however, anyone who works with mammography equipment must pass the ARRT exam or meet the standards of issuance for a certified technician through ARRT. Missouri does not license or have credentialing requirements for operators of radiologic equipment. Nevada operates in a similar fashion as Michigan. If a technician operates mammography equipment, she must pass the ARRT exam; otherwise, she is not subject to licensing or credential requirements. New Hampshire does not require operators of radiology equipment to obtain a license or seek credentials. North Carolina does not require a license or ARRT exam for operators of radiology equipment. North Dakota does require general diagnostic operators to pass the state, ARRT or American Chiropractic Registry of Radiologic Technologists (ACRRT) examinations. It does not require limited-use operators to pass an exam. Limited-use operators can perform chest, ribs, abdomen, podiatry, skull/sinuses, extremities and/or spine services only. Limited-use operators must complete a course on the subject and have a passing grade in the subject. No licensing or ARRT exam requirements exist in South Dakota for those practicing radiology. A person with 24 hours of training by a qualified instructor may perform X-rays. Dental radiographers must have at least 16 hours of training. Reduce the number of radiographs per patient. Reduce the time and intensity of exposure. When fluoroscopy is not essential, use conventional radiography. Use the smallest possible field size. Avoid inclusion of the gonads in the primary beam. Protect testicles with gonadal shields. Properly train and supervise staff engaged in these examinations. With the passage of proposed federal legislation and state licensure laws, the public will benefit from being cared for by properly educated and certified radiologic personnel. No matter what the radiologic procedure, the technologist's detailed knowledge of anatomy, careful application of radiation and skillful operation of sophisticated medical equipment are the keys to its success. To be clinically useful, diagnostic imaging exams must be accurate. To stop invasive cancers, radiation therapy treatments must be precise. The current lack of uniform educational standards nationwide for operators of radiologic equipment poses a hazard to the public. State and federal standards will ensure a minimum level of education, knowledge and skill for the operators of radiologic equipment. Ultimately, they will reflect the radiologic technologist's ability to provide the highest quality of patient care. Bart Pierce, Randy Harp, Barb Smith, Anne Warden, Susan Putnam-Hopkins, Virginia Vanderford, Susan Castanette, Peggy Keith, Thomas King and Bobbi Guzman. As President of the Oregon Society of Radiologic Technologists (OSRT) I am proud to announce National Radiologic Technology Week(R), Nov. 6-12. This special week was created by the American Society of Radiologic Technologists (ASRT) in 1979 to be celebrated each year encompassing Nov. 8, the day that German physicist Wilhelm Conrad Roentgen discovered the X-ray in 1895. Radiologic Technologists (RTs) are the medical personnel who perform diagnostic imaging examinations and administer radiation therapy treatments. We work with some of the most innovative equipment in the medical field to help identify pathologies, plan and administer treatment and restore patient health. RTs specialize in mammography, computed tomography (CT or CAT scan), cardiac-interventional procedures, magnetic resonance imaging (MRI), nuclear medicine, ultrasound, radiation therapy and general diagnostic radiology (X-ray). Each acquires images of the body in a different manner -- some use radiation, some use sonar waves, others use magnetism and radiofrequency pulses. The equipment used by technologists is phenomenal! I am in awe of the complexities of these machines, the science behind the technology and the professionals who dedicate their time and effort to providing for societal health. Most RTs attend a two or four-year program, ending up with either an associate's or a bachelor's degree. After graduation, there is a national board exam administered by the American Registry of Radiologic Technologists (ARRT) for licensing and credentials. In Oregon, all RTs must also be licensed through the Oregon Board of Medical Imaging (OBMI). The requirements to work as an RT vary widely among states. As a matter of fact, there have been multiple attempts made to adopt legislation that would set a national minimum standard of education for technologists across the country. I was in Washington DC in the spring of 2014 meeting with legislators and trying to help gain support for the CARE bill (Consistency, Accuracy, Responsibility and Excellence in Medical Imaging and Radiation Therapy). Currently we are still working to get these basic requirements adopted into law. If you'd like to know more, please visit: http://cqrcengage.com/asrt/CARE. Fortune has smiled on me when it comes to my profession. Not only have I found an ideal career as a Radiologic Technologist (RT), but I am blessed beyond measure to know so many other dedicated, caring and educated technologists who are just as passionate as I am. Providing patients with safe medical imaging examinations and radiation therapy treatments is the prime goal for RTs. To recognize the vital work of Radiologic Technologists across the state, the Oregon Society of Radiologic Technologists is celebrating Nov. 6-12, 2016. About OSRT and ASRT: Bobbi Guzman, RT(R)(MR) is President of the OSRT, a statewide association with a mission to develop a dynamic membership promoting and facilitating world-class radiologic patient care through enhanced market awareness and effective legislation. She resides in Albany and works for Mission Medical Imaging in Salem, Oregon. www.OregonSRT.org.